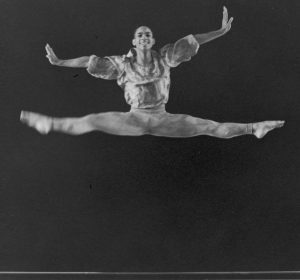 On February 14, 1952, Louis Johnson performed in Jerome Robbins’ Ballade with NYCB. Johnson starred in Ballade alongside the rising star of the genre Nora Kaye and Janet Reed. The musical score was by Claude Debussy and was 13 minutes in length. Louis Johnson was born March 19, 1930 in Statesville, North Carolina. He later moved to Washington, DC where he trained alongside Chita Rivera under Doris Jones and Clair Haywood. Johnson then relocated to New York City to study at the New York City School of American Ballet(NYCB). He refined his artistry with ballet visionaries George Balanchine and Jerome Robbins.